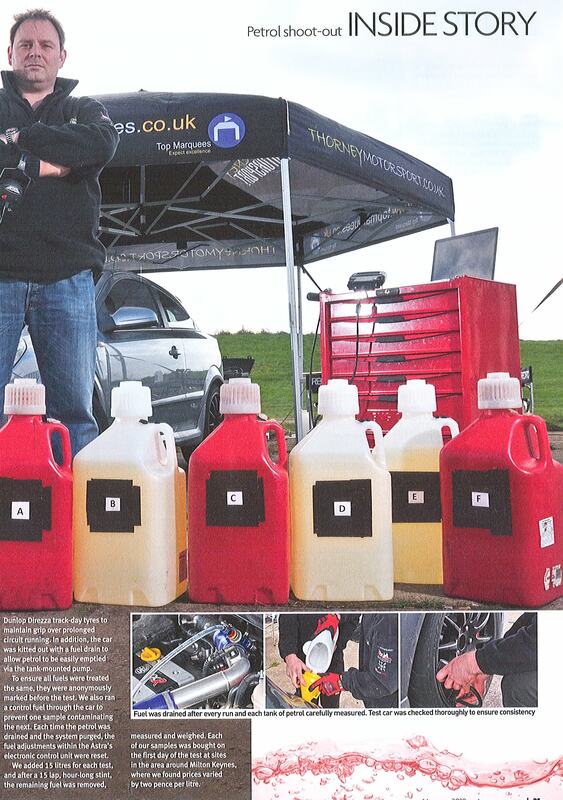 The test process was straight forward, the car was drained of all its fuel, filled with a measured 15 litres of test fuel and then driven round a specific test circuit by a single test driver for a set number of laps. Once completed the remaining fuel was drained into a container, measured and weighed then a control fuel was run through the system, drained then the next fuel tested in the same manner. Due to Thorney Motorsport’s main business of Vauxhall and BMW road car tuning and racing an Astra VXR was selected as the test car, having a relatively powerful 240bhp engine it is a car the team know well having raced two for the last two seasons in the Dunlop Sportmaxx Championship. The test would involve three days on track so some modifications were taken out on the car to minimise any inconsistencies brought about by mechanical wear and tear. The car was fitted with uprated brakes to ensure that braking efficiency was not affected from extended track use, an uprated intercooler was fitted to ensure intake temperatures maintained consistency throughout the test period and Dunlop Direzza track day tyres and Team Dynamics Lightweight wheels fitted to ensure grip levels were identical for the test duration. The cars standard ECU map was run with the Sport button disengaged to keep the throttle position map as smooth as possible. These modifications were purely to ensure that the car performed identically from the first lap to the last lap of the test. 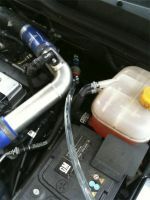 To ensure we collected every possible drop of fuel from the test car it was fitted with a fuel drain line. Fitted in line to the fuel rail the system used the vehicles fuel pump to pump the fuel from the tank, the fuel rail and all the connecting pipe work. 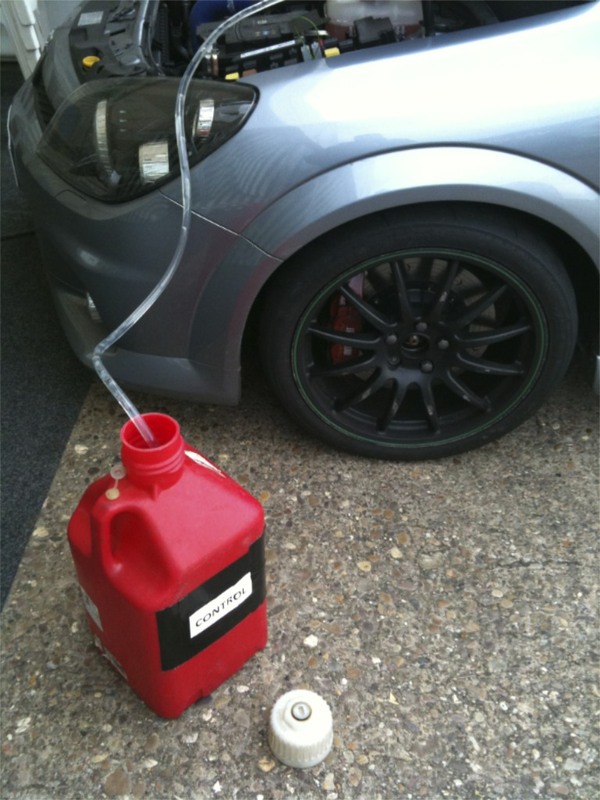 As the Astra VXR has a ‘wet’ in-tank fuel pump this allowed the vehicles pressurised fuel system to be used to completely purge the car of any fuel left in the tank and all associated pipe work. However to ensure that there was no test fuel cross contamination after each fuel was tested and purged a separate control fuel was put into the car and the car driven to ensure that any remaining fuel in the pump and the filter was the same for each test fuel, this control fuel was also purged from the system before each test fuel. 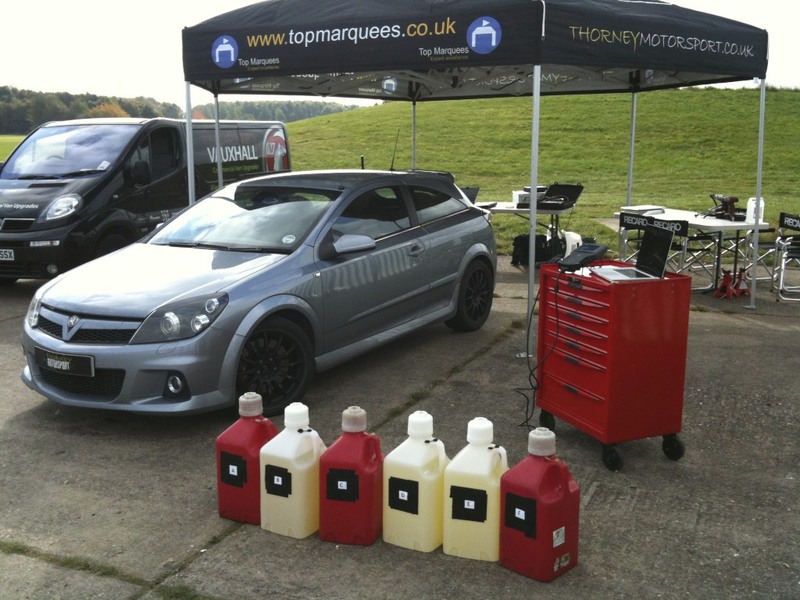 At each fuel change the cars ECU was interrogated using an official Vauxhall diagnostic tool and the vehicles fuel trim values re-set. Fuel trim sensors are constantly measuring the relative performance available from a fuel so to avoid any ‘legacy’ settings in the cars ECU these were re-set to zero for each fuel. The greatest source of inconsistency on a road test, be it fuel or any other vehicle assessment, is the driver. People have different driving styles from journey to journey and person-to-person so we needed to drive the car in such a manner as to be 100% repeatable for each fuel tested. To help ensure this driving accuracy the test car was fitted with full data logging and GPS transponders, these enabled us to accurately measure the cars performance on track and ensure that each fuel was tested in identical driving conditions. 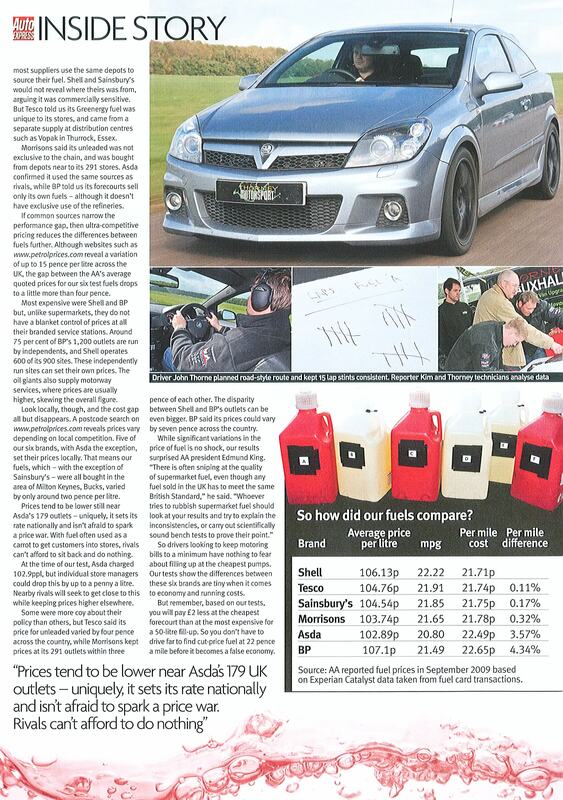 Of crucial importance is the test driver and for this test we utilised the company’s main test driver, John Thorne. 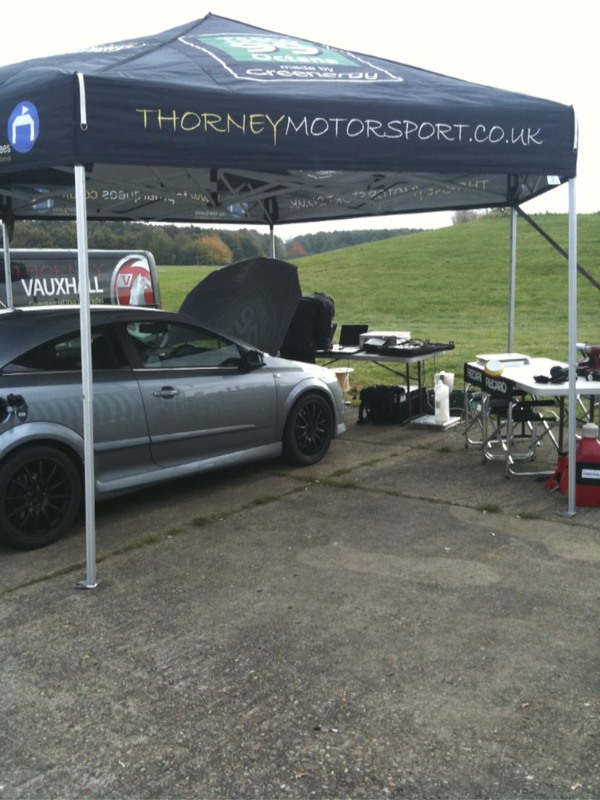 John is Thorney Motorsport’s founder and one of his responsibilities at the company is the research and development of all the company’s road car upgrades and all the race car development, this includes each one of the company’s BMW and Vauxhall race cars. One of John’s roles involves the track set up of road and race carsa this requires extensive track driving to ascertain where changes in the cars set up are reflected in the cars performance. Bruntingthorpe Proving Ground was booked for the exclusive use of the fuel test so there was no traffic to take account of and John initially went out for 7 laps to set a representative lap time and driving line round track that he needed to repeat accurately for the duration of the fuel test, it was crucial that the fuels were tested identically. All the fuels were marked anonymously so John and the rest of the test team were unaware which fuel was which during the test. 7. 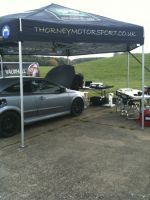 Test car driven for 15 laps of test circuit at consistent 3 minute 18 second laps, full continuous data logging recorded. 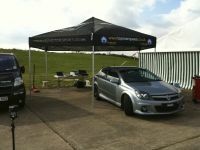 Average test time one hour, total distance 59 Miles per car. 354 Miles total. 8. 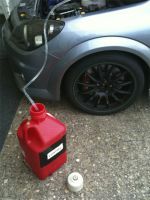 Remaining test fuel drained and purged from the car, measured and weighed. 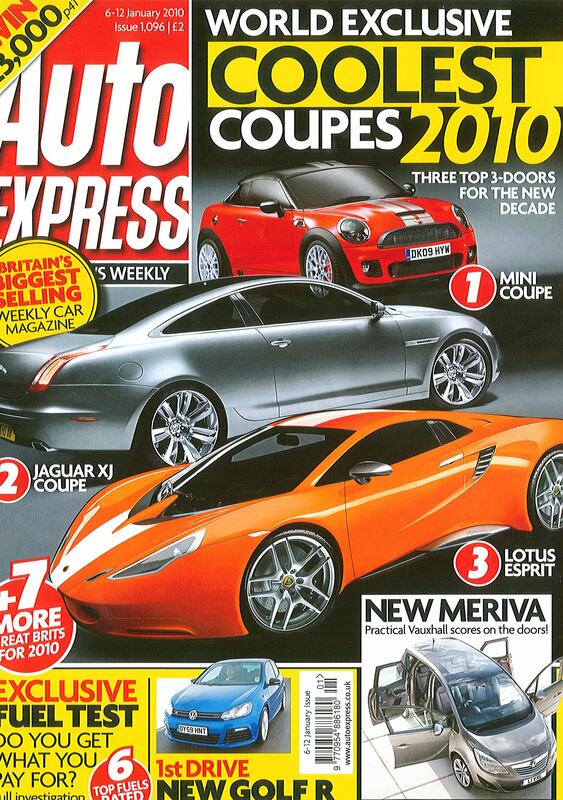 The clear winner was Shell, which offered both the lowest price and the best fuel economy. 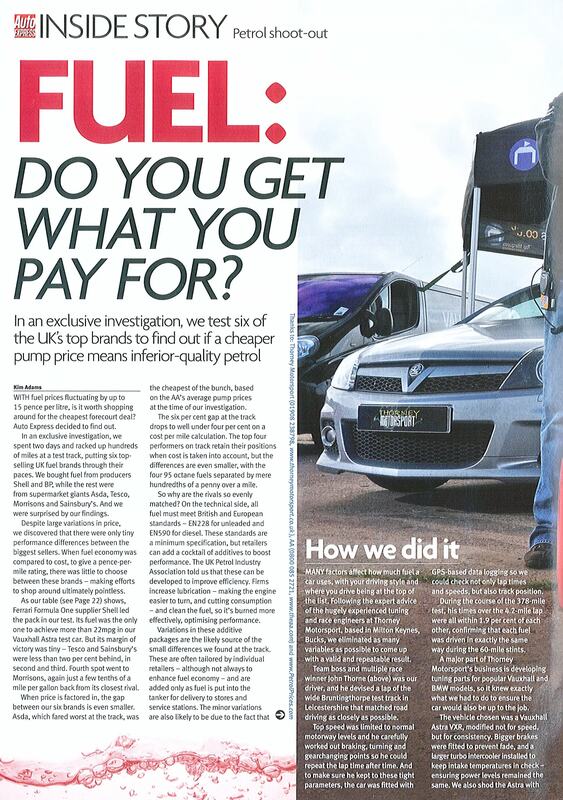 The worst was Asda which whilst the equal cheapest on test (ironically the same price as the best fuel) but offered significantly less fuel economy. Our expectations before the results were that all the 95 octane fuels would be broadly similar and some of this is reflected in the data, in percentage terms the top four fuels are covered by less than 5%. However worthy of note is the relative poor performance of the Asda fuel, which whilst the cheapest on test also gave nearly 8% less fuel economy than the top performing fuel (Shell), 8% over 10,000 miles is not to be ignored. The bottom line is, for the most part there is precious little difference in fuel economy between the big branded fuels and supermarket offerings with the latter supplying some of the best fuels in the test, shop wisely.